Printer’s Parts & Equipment is proud to offer a turnkey solution for all your graphic arts equipment needs. With our large stock of inventory, refurbishing workshop, professional dismantling, rigging and transport, financing, installation and post-sale service, we are setting the standard in the industry. Aside from our retail sales department, we are also one of the largest exporters of quality second hand equipment in the world. With over 50,000 square feet of storage space, we have the ability to keep a large inventory of used offset, finishing and bindery equipment. All machines are inspected and checked upon arrival in our warehouse, and all inventory is maintained for optimum performance. 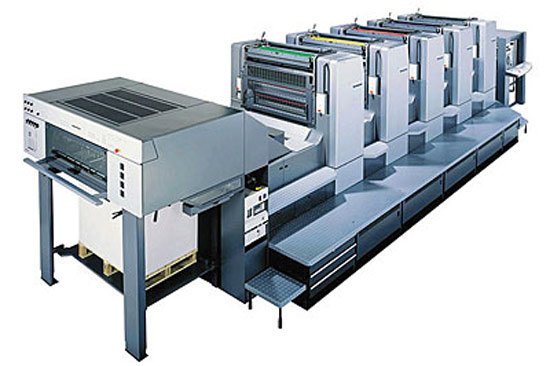 Our stock includes Heidelberg, Komori, Man Roland, Mitsubishi, Ryobi, Polar, Bobst, and Muller Martini—the leaders in the field of graphic arts machinery and equipment. You will not only get a full inspection report of our inventory, but also a history of the machine so you can be confident in your choice of machine and its optimum performance within your production needs. If required, our facility is equipped to provide cleaning, overhauling and refurbishing services. Our factory trained technicians oversee the entire process to ensure the press is thoroughly cleaned and checked, new rollers installed, and the press painted with original factory paint colors. As a full-service graphic arts machinery and equipment dealer, Printer’s Parts & Equipment is proud to offer professional dismantling, rigging and logistical services in order to ensure a seamless transition for your equipment purchase. Our technicians will ensure the press is correctly dismantled, labeled and inventoried to facilitate easy assembly upon arrival. We only used qualified, licensed and insured riggers to ensure all equipment is safely secured for transport. All export shipments are properly sprayed with anti-rust solution, skidded, strapped and braced to ensure safe voyage and arrival at their final destination. All loadings are photographed and inventoried to ensure our customer’s peace of mind as they anxiously wait to receive their equipment. Printer’s Parts & Equipment is one of the few exporters in North America who readily accept letters of credit from our export customers and support financing for our retail buyers. Letters of credit allow our clients to be protected from fraudulent sellers and at the same time receive credit terms of up to 1 year, if required. We work with a variety of lenders to secure the best rates and terms for our North American customers. Contact us today to explore the variety of options available. Printer’s Parts & Equipment offers installation and training in equipment worldwide. We have successfully installed equipment in North and South America, Europe, Asia and Africa and we will happily provide references to any potential customers. Our in-house technicians work with local engineers and specialists to ensure that the final print test meets or exceeds all your expectations. When buying a piece of equipment from Printer’s Parts, we will gladly buy your older equipment for our inventory. As one of the largest exporters of used printing machines, we can offer you full value for your trade ins. No need to find a third party or a multitude of disruptive wholesalers to sell your excess equipment. With PP&E, we will buy your trade in, coordinate removal with the new installation and minimize downtime during the transition. If you’re looking for an appraisal or contemplating liquidation or an auction, Printer’s Parts & Equipment has the experience to provide you the necessary insights and options . We offer free appraisals and complete auction services from online to onsite sales to maximize your returns. We can offer an outright cash purchase, a minimum guarantee, or simply do a commission based sale. Contact us today to find out which solution works best for you. When it comes to investing in graphic arts machinery and equipment, more knowledge allows you to make better business decisions. With our help, you can make sure you have all the necessary information and feel confident in buying the right equipment at the right price. Beyond large offset machine and finishing equipment, PP&E maintains an inventory of thousands of small parts and consumables to meet your printing needs. When you don’t need an entirely new press, but you need that vital part—and fast—PP&E has what you need to maintain your productivity. From replacement parts to rubber rollers, you won’t be disappointed in PP&E’s selection or our free shipping options and ability to order online. Printer’s Parts & Equipment is one of the largest exporters of quality used equipment in the world. Last year alone we shipped over 200 containers to our buyers worldwide. Our ability to source and procure equipment directly from the source allows us to competitively offer equipment to other dealers and printers throughout the world. We handle all aspects of the wholesale transaction including inspection, travel arrangements, dismantling, container arrangement and loading, insurance and export documentation. We accept Letters of Credits and can provide flexible payment terms.